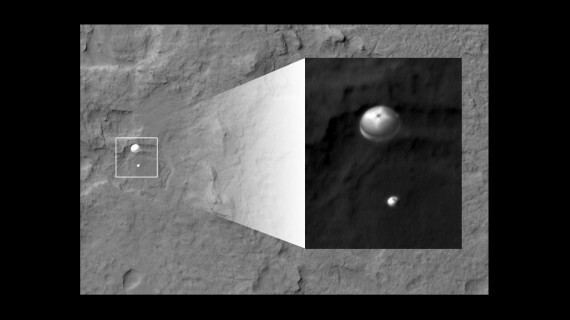 It's appropriate that the MSL, Curiosity Rover, landed during the Olympics. It was a gold medal for NASA. I'm an engineer and I know that if anything can go wrong it will. But nothing went wrong. They were even able to to get a picture of the descent. Is that cool or what? It will be a couple of weeks before Curiosity gets down to work and it will incease our knowledge of not only the Red Planet but the solar system. But the real story is the engineering itself. This is a real example of American exceptionalism. It's not how many countries we can invade and occupy but ideas that make the United States exceptional. I have been both a hardware and software engineer and I find this accomplishment nothing less that amazing. Yes, that picture utterly blew my mind. One space mission capturing a picture of a different space mission, in about a three minue window, on another planet. That simply defines awesome.